Elizabeth Edwards: "Reform Health Care Responsibly, Morally, and Aggressively." As today marked the 30th anniversary of the “War on Cancer,” Elizabeth Edwards and Lance Armstrong appeared at a US Senate Committee Panel to push for a renewed fight against cancer. Read more about Elizabeth Edwards: "Reform Health Care Responsibly, Morally, and Aggressively." Edwards Supporter For Obama: On the Ground in North Carolina! I have joined the ranks of a number of other Edwards supporters for Obama, including numerous top advisors of the Edwards campaign and yesterday, here in the Great State of North Carolina, I voted! Obama at the NC JJ Dinner: Stand Up! Read more about Edwards Supporter For Obama: On the Ground in North Carolina! Taking time off from her family vacation in Florida, Elizabeth Edwards commented on the GOP racist ad, “Extreme,” during an MSNBC interview, calling it an “assault weapon.” Elizabeth went on to support Obama’s decision to separate himself from Reverend Wright. Elizabeth Edwards: Still Fighting. Still Blogging! Read more about Elizabeth Edwards: Still Fighting. Still Blogging! Endorsements Roll In for John Edwards while on the Campaign Trail in South Carolina! While out on the campaign trail in South Carolina on Thursday, Senator Edwards won two key endorsements, the first from the Communications Workers of America of the early primary state of Nevada, with the second from notable social activist, Harry Belafonte. As labor expert Jonathon Tasini predicted, the Nevada Communications Workers of America endorsed John Edwards. Read more about Endorsements Roll In for John Edwards while on the Campaign Trail in South Carolina! Edwards Evening News RoundUp: Where Even Elizabeth Gets Her News! Welcome to the Edwards Evening News Round Up where even Elizabeth Edwards gets her news about John's campaign! II. Expanding the Map: A True Blue Majority! Read more about Edwards Evening News RoundUp: Where Even Elizabeth Gets Her News! A couple of weeks ago, I attended the South Carolina Presidential Candidate “Debate” as a credentialed blogger and had the opportunity to talk for a minute with Mudcat Saunders, after the debate. "I went out for an egg sandwich one morning and ended up in the middle of a presidential campaign," Saunders told members of the Democratic National Committee's Southern Caucus last summer. "I still don't know how I got here." John Edwards released his first ad today which will air in the DC area and has an online component. It's on YouTube and the Edwards campaign is asking people to send in their video messages to Bush, to include in the ad. This is yet another innovate approach the Edwards campaign has taken, to be inclusive of the netroots. 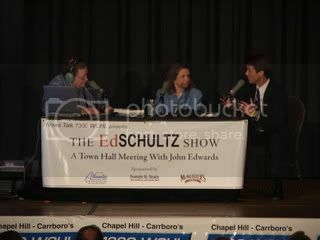 John Edwards Unfiltered: Webisode Videos and Chapel Hill Edwards Rally! I've come to the personal conclusion that I actually want the country to see who I am, who I really am. But I don't know what the result of that will be. But for me personally, I'd rather be successful or unsuccessful based on who I really am, not based on some plastic Ken doll that you put up in front of audiences." Read more about John Edwards Unfiltered: Webisode Videos and Chapel Hill Edwards Rally!